Happy New Year! I’m feeling quite positive about 2013. I think it’s going to be a good year for all. I’ve decided to take the “glass half-full” approach. No real resolutions. Do we ever keep them? I’m just going to try to be more positive and block out the negativity. Our holidays had their ups and downs, but just spending time with family and friends, enjoying a delicious meal is what I always look forward to the most. After too much cooking over the holidays I was trying to think of some easy recipes to make the family as school and work soon kick back into gear. Yes, the holidays are over and it’s time to get back into the old routine… but with that renewed “glass half-full” optimistic approach to things. Make life a little easier. To start, you could make this simple Puttanesca I’ve adapted from the wonderful Lidia. Super quick and perfect for a weeknight dinner. Did you know Puttanesca translates to “whore’s style spaghetti?” I’ve also seen it referred to as “in the style of a prostitute” and “made by ladies of the evening.” I recall the history as follows… since the “ladies” worked late nights and weren’t able to get to the markets for fresh ingredients, they created Puttanesca by using common ingredients they already had available in their pantry. They certainly were on to something. How could the combination of anchovies, olives and capers ever be bad? Brilliant! It’s one of those dishes you find on the menu at most Italian restaurants, but personally I’d never think to order it. It couldn’t be simpler to make at home, includes all the staples you probably already have, and it whips up fast for a perfect dinner. I picked up Lidia’s Italian-American Kitchen about a year ago. I think I bought it because a friend mentioned it had the best lasagna recipe. Lasagna is such a project, I still haven’t made it. But I have made Lidia’s sausage and peppers, spaghetti with mushrooms, garlic & parsley and this awesome dish of Puttanesca. I need to find time to make more from this book. Bring a large pot of water to a boil for your pasta. Cook pasta according to package directions. Remove it about 1 minute early as it will cook for a minute in the pan with the sauce. Meanwhile, as you wait for the water to boil, pour the canned tomatoes in a large bowl and crush them with your hands. Set aside. Heat 3 tbsp of olive oil on medium-high heat in a large (6qt) sauté pan. You want the pan to be big enough to hold the sauce and the pasta. Add the garlic to the olive oil and cook for 2 minutes, stirring constantly. Add the anchovies and break-up with the back of a wooden spoon. Add the olives to the pan and stir for 2 minutes. Pour in the bowl of canned tomatoes, sprinkle with red pepper flakes and toss in the capers. Stir to combine and bring to a simmer for 5 minutes. Drain the pasta when ready and add it to the pan with the sauce. Toss the sauce and pasta together and remove the pan from the heat. Sprinkle the Pecorino cheese and combine again. Serve immediately with a nice glass of Italian red wine and a hunk of crusty bread. YUM! I’ve committed a lot of time to the sandwich at 4plates. Creating unique sandwiches, finding ways to use leftovers to make a sandwich, talking about sandwiches, and of course, eating sandwiches. I’ve declared that the sandwich is my husband’s favorite food group, and other than the banana, it could quite possibly be the perfect food. According to Alan Davidson’s Oxford Food Companion, the origin of the sandwich is generally attributed to the 4th Earl of Sandwich, John Montagu. He was said to have eaten his food in the form of a sandwich to avoid having to stop playing cards. Meat tucked between two pieces of bread, kept the cards free from meaty, greasy fingers… lovely. The sandwich has evolved far beyond the Earl’s slab of meat on bread. Almost every culture has their own version of the sandwich. 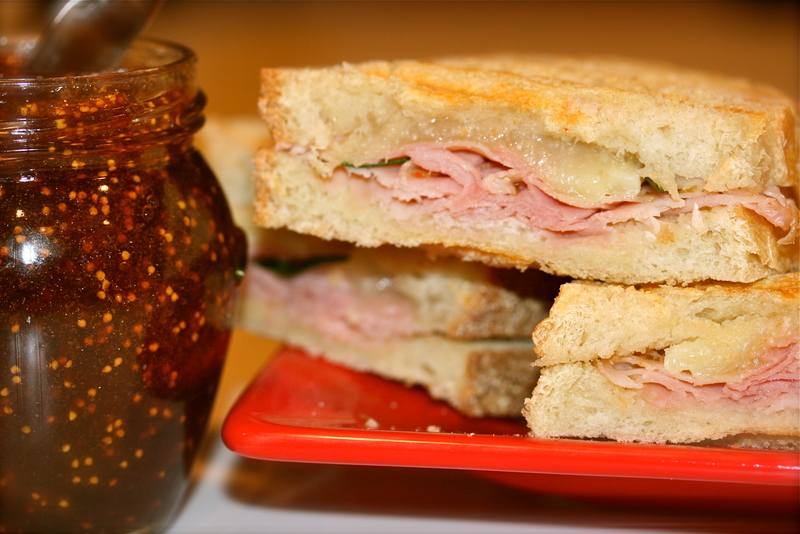 It’s no surprise that the Italians have perfected the marriage of meat and bread with their panini sandwich. 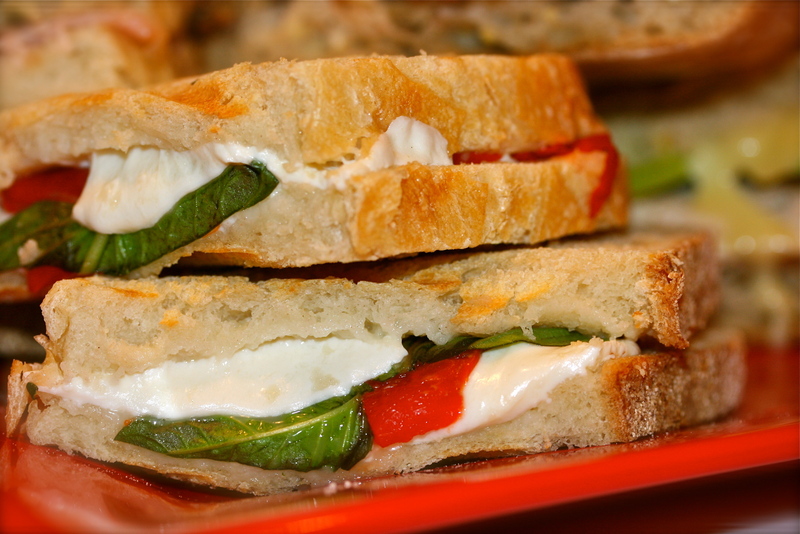 Whether made on a hearty ciabatta, perfectly baked focaccia or slices of Italian boule, it’s fantastico! We received a panini press years ago as a gift, and I have to admit we use it often. 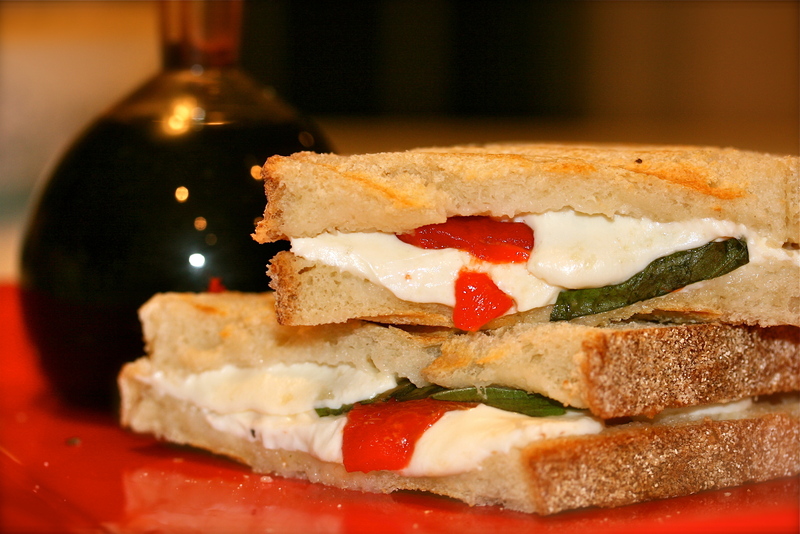 It makes the insides deliciously melty, and the bread gets that perfect grilled crunch. 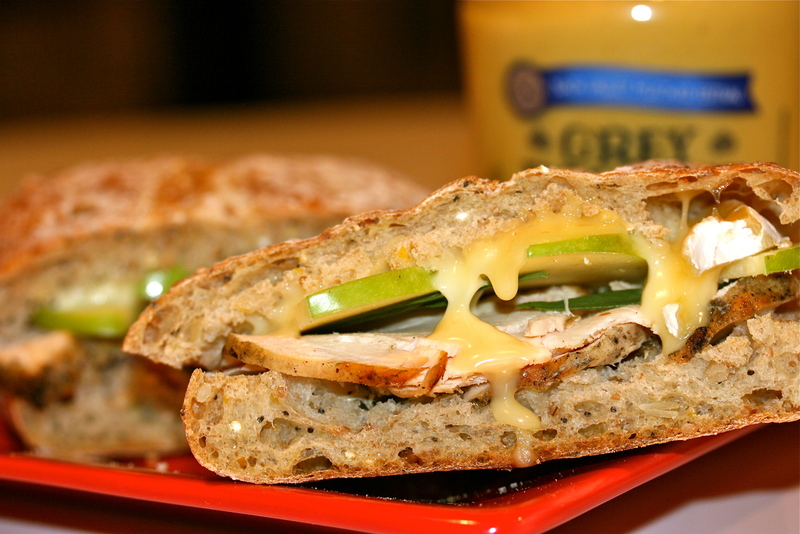 No oil or butter needed on the outside of the bread, eliminating unnecessary calories. I have a Delonghi machine, but there are many brands & styles available. For around fifty bucks, you can get yourself a nice electric panini press. Many a panini has been made in our kitchen. Here is a list of a some delectable ingredients that you can put between a hearty hunk of bread. It’s like the old Chinese restaurant menus… pick one from column A, two from column B and pray the fortune cookie you picked has you winning the lottery. * Don’t forget you can sweeten it up too. Nutella and banana could be the best combo yet!